You can use the Wholesale Order window to submit Block Trades on GMEX for product’s that support Block trades at the exchange. 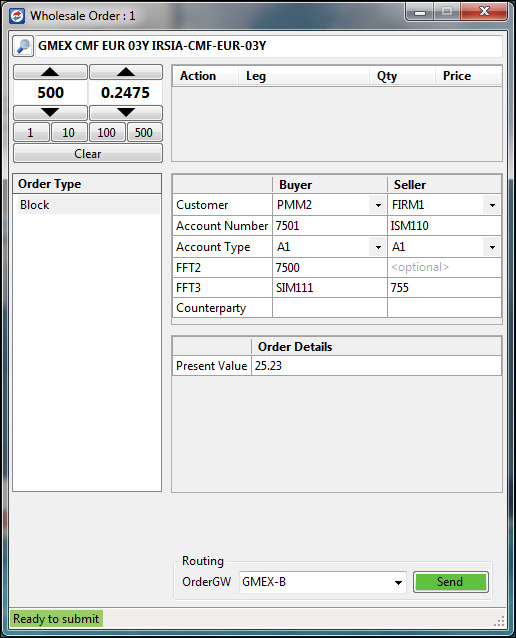 Verify that Block is selected in the Order Types pane and set the quantity and price for the Block trade. The table below lists the common fields for submitting wholesale trades on GMEX. When a customer selection is made, the Account Number field is populated with the customer’s TT account number. Sets the TT Customer Account Number assigned to the Buyer or Seller’s GMEX Gateway login in TT User Setup. An account number is required for Block trades, but is not sent to the exchange. Sets the type of account type and account code for the trade. If set to Giveup (e.g., G2), you must populate the Giveup field with the take-up member ID. Optional, user-defined value. Not mandatory for order routing. Enter the account number provided by the exchange. This is a required field and is sent to the exchange as FIX Tag 1. Sets the firm name of the counterparty for each side of the trade. This is a required field. Sets the price of the contract in terms of Present Value. This is an optional field.